October | 2018 | Mike Lamberti, From Margate To Cleveland, And Back ! Belleville and Nutley will meet for a 76th time on the gridiron on Nov. 3, at the Oval, in Nutley, starting at 1:30 p.m.
As with any series, there are plenty of key statistics and nostalgia which comes with the game itself. Here are some interesting tidbits for the fans, as they prepare for this years’ renewal. Nutley leads the series, which began in 1924 and was played continuously from 1944-2015, 52-19-4. The Raiders are 26-4-2 against Belleville since 1984, including 18 wins in the last 19 games and an 11-game winning streak (1997-2007), the longest in the series. For nearly 40 years, the game was played on, or around Columbus Day. In 1983, it was moved to Opening Day and the following year, the Belleville-Nutley game was moved to Thanksgiving, where it stood for the next 28 seasons. In 2012, it was moved to opening day and was Nutley’s season opener through 2015. Belleville’s longest win streak in the series was six in a row from 1978 through 1983. Belleville’s 44-7 win in 1952 was its largest margin of victory in the series while Nutley’s 62-12 victory in 2015 was its largest margin of victory. There have been 31 shutouts in the series, with Nutley accounting for 22. 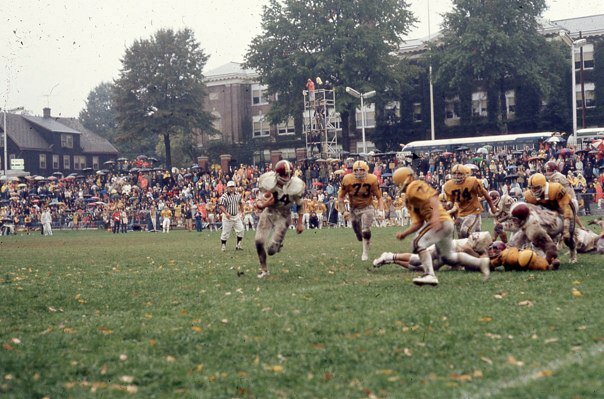 Among those shutouts was a scoreless tie in 1975, despite the fact that Belleville appeared to score two touchdowns, but both were called back because of penalties in a driving rainstorm at the Oval. In 2009, the scoreboard almost exploded in a game won by Nutley, 58-36. Among the marks broken in that contest were most combined points in a game (94) and most points scored by the winning and losing team in a game. There are four ties in the series, including back-to-back stalemates in 1992 and 1993. 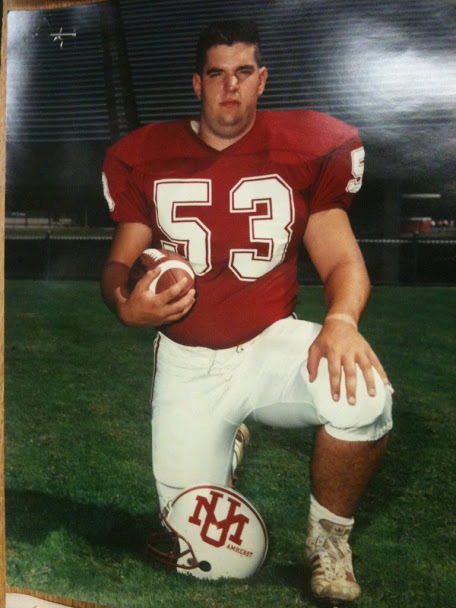 There has also been one overtime game in the rivalry, back in 1997, which Nutley won, 20-14. Belleville will play at the Oval this year, seeking its first win there since 1983. Former Belleville head coach, Chris Strumolo, played football at Nutley from 1988-1991, where he was 3-1 against Belleville and coached the Bucs from 2008-2010, where he was 1-2 against his former school. Rich SanFillipo played at Belleville from 1964-1966 (he was 1-1-1 as a player) and later coached the Raiders from 1990-1997, where he was 4-2-2 against his alma mater. Belleville’s John Senesky has the most wins in the series as a head coach from either program. Senesky was 9-9-2 against the Raiders in 20 seasons. As a player for the Bellboys from 1960-1963, Senesky was 1-3 against his rival. When Belleville beat Nutley, 33-12, in 1962, Senesky scored a touchdown. In his senior year, 1963, Senesky broke his leg in the game against Nutley, but didn’t know it was broken for two weeks and continued to play. Nutley’s Sandy Phillips was 8-1-1 against Belleville from 1955-1964. Jim Kelly never lost against Belleville. A former Nutley player from 1973-1976, where his teams were 3-0-1 against the Bellboys, Kelly was 6-0 as a coach against the Bucs from 1998-2003. Mario Cocchiola was also unbeaten as a coach against Belleville, compiling a 4-0-1 mark from 1973-1977. Steve DiGregorio, played for the Raiders from 1975-1978 (he was 2-1-1 against the Bellboys and Bucs) and was 7-1 against Belleville as a Nutley head coach from 2004-2011. 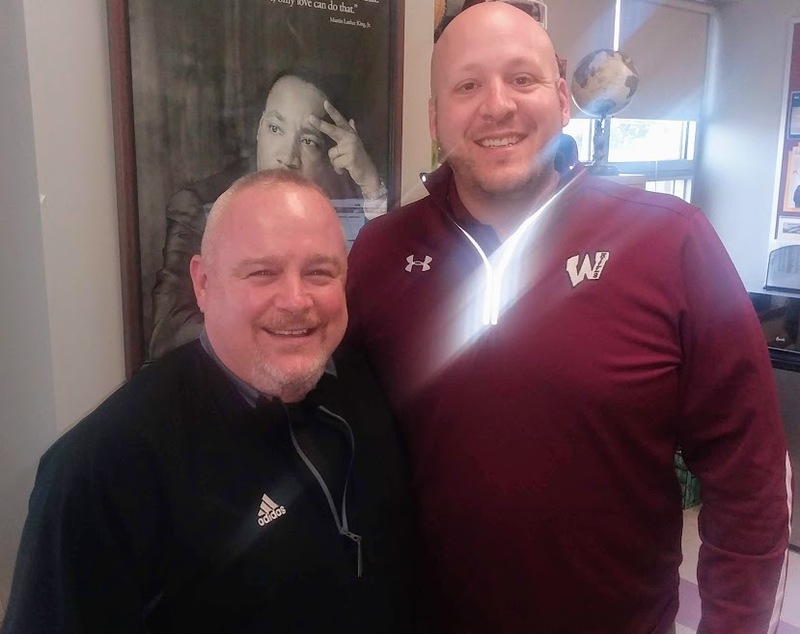 DiGregorio returned as head coach in 2017 and will look to tie Phillips as the all-time winningest Nutley coach in the rivalry, this Saturday. Tom Basile was 4-0 against Belleville as a head coach, from 2012-2015. Belleville’s last win the series came in 2008, when Strumolo, a first-year head coach, guided the Bucs to a 22-12 victory at Doc Ellis Field. This season, Belleville head coach Jermain Johnson will coach in his first game in the rivalry. Here are the scores of the first 75 Belleville-Nutley games. 1994: Nuitley 14, Belleville 6. 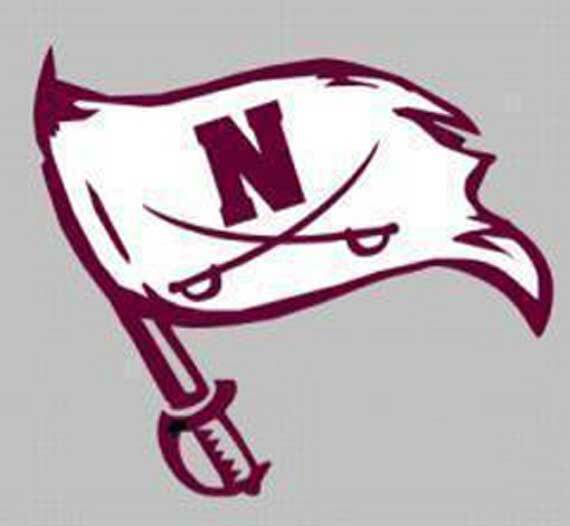 2011: Nutley 49, Belleville 14. 2012: Nutley 17, Belleville 12. No. 10-1971, Belleville 7, Nutley 6: Joe Lotriglio scored the Bellboys’ only touchdown in the first half and Belleville hung on for a 7-6 victory at the Nutley Oval. No. 9-1983. Belleville 12, Nutley 6: After a generation of playing this rivalry on the third week of the season, it shifted to week five of the 1982 campaign, then on to opening weekend in 1983. The Bucs were in the midst of a dominant run in the rivalry. having won five straight from 1978-1982. In this game, Belleville opened a 12-0 lead into the fourth quarter before the Raiders cut the lead in half. Belleville went to a 12-6 victory. Nutley would actually have a better overall season in ’83, qualifying for the playoffs for the first time in school history, under second year head coach Pete LaBarbiera. The Bucs had a solid season, finishing 6-3, but missed the playoffs. This win by Belleville in ’83 marked the last time, to date, that the Bucs have beaten the Raiders at the Oval. No. 8-1980, Belleville 13, Nutley 7: The Bucs were the heavy favorites in the first-ever night game between the two rivals, but the Raiders played really well in this week three contest. The game was tied at seven in the fourth quarter before Belleville quarterback John Melillo ran 45 yards for the winning score. The ’80 Bucs actually started slowly that season, but ended up with a nine game winning streak and a berth in the state sectional final at Giants Stadium. Many fans will recall that this game actually got the Bucs off and running. No. 7-1975, Belleville 0, Nutley 0 (tie): A tremendous week three game in a steady downpour at the Oval ended up in a scoreless tie. Belleville had the better scoring opportunities, including what appeared to be a punt return for a touchdown by Anthony ‘Chipper’ Biafore, but the score was called back because of a clipping penalty. Nutley had a late chance to score, but the Bellboys defense held. This would be the only scoreless tie in the series’ history. No. 6-1990. Belleville 21, Nutley 6: The Bucs’ offensive line would dominate this game, as Belleville snapped a three game losing streak to Nutley, at Doc Ellis Field. Carmen Spina was named Belleville’s MVP. The big play occurred in the first quarter, when Belleville blocked a punt and Billy Salvatore returned it for a touchdown. The ’90 Bucs would finish the season at 6-3. 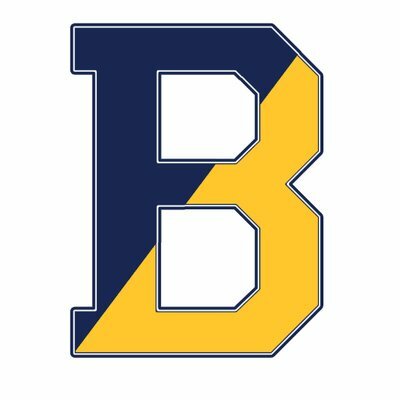 No Belleville team has won six games since. No. 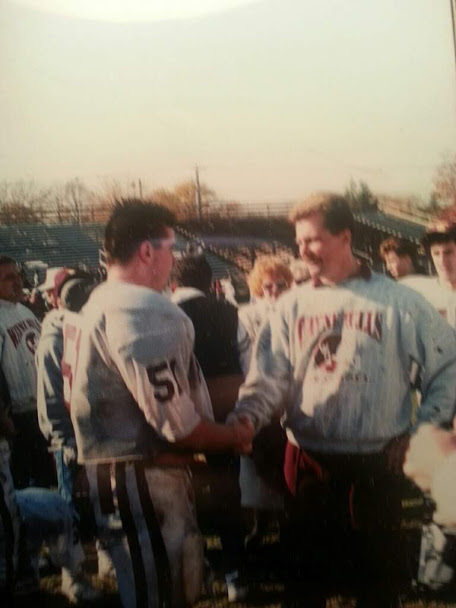 5-1996, Belleville 20, Nutley 0: In John Senesky’s final game as head coach after a record 20 seasons at the helm, Belleville played a solid game and beat Nutley for the first time in six years. The number 20 had a lot of meaning here, in that it was Senesky’s 20th season, with 20 seniors, in a 20-0 win. No. 4-1986, Belleville 27, Nutley 16: The Bucs beat Nutley for the first time, ever, on Thanksgiving, as Jeff Spilsbury and Jim Dunphy paced the way to an impressive win. The Bucs led 27-0 at one point before Nutley scored two fourth quarter touchdowns. The win put a nice finish on a 6-3 season, that included six wins in the team’s last seven games. The Bucs also won an NNJIL title that season, the program’s last conference crown, to date. No. 3-2008. Belleville 22, Nutley 12: No question, a huge win for a team that hadn’t beaten the Raiders in 12 years. A solid Belleville offense was paced by quarterback Nicky Herrmann, as Belleville won on a sloppy turf at Doc Ellis, to finish 5-4 in the regular season. No. 2-1992. Belleville 7, Nutley 7 (tie): For a long time, this was my number one game in the series, but I’ll bump it to second here. Nutley was en route to a state championship in ’92, with a 7-1-1 record, when the teams met on the Saturday after Thanksgiving, while a hard-nosed Belleville team was 3-5, but had played much better than the record would indicate. Belleville and Nutley both had chances to win it late with a field goal, but both kicks were wide. John Alvarado and Mike Citarella stood out on defense for the Bucs. No. 1-1978, Belleville 31, Nutley 0: There was so much symbolism in this game, as the new-look Bucs dominated from the beginning to beat Nutley for the first time in 12 years at home. Quarterback Ed Aulisi and running back Mike Nicosia paced the offense while team captains Angelo Santinelli and Joe D’Agostino paced the defense. Belleville would finish 6-3 in ’78, marking the beginning of seven straight seasons of outstanding football at BHS. 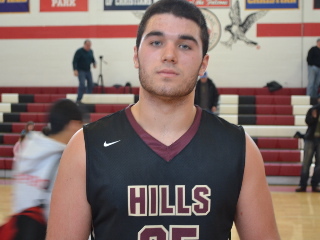 Wayne Hills High made a tremendous choice in naming Rob Carcich its new boys basketball coach. 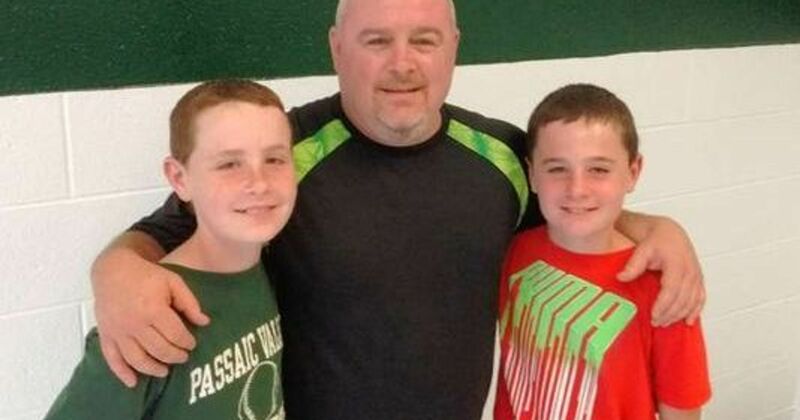 Carcich, who had tremendous success at Passaic Valley for over a decade, with his vaunted 2-3 defense, takes over a program which enjoyed some good seasons under Kevin Grimes, for the past five years. The 2017-2018 Patriots won the Passaic County Tournament championship and made a nice run in the NJSIAA Tournament, en route to a 21-8 season. 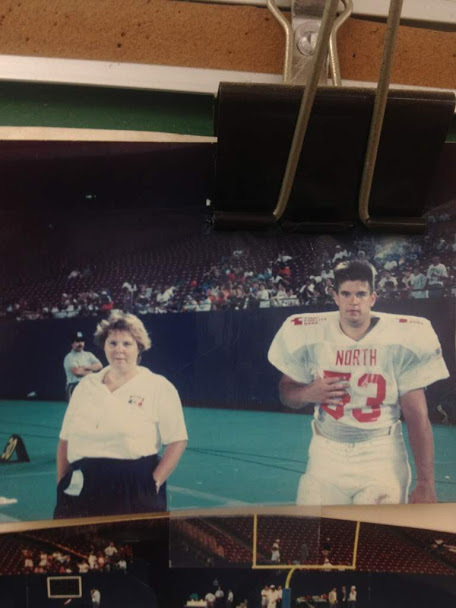 Grimes also guided the Patriots to three straight 20-win seasons, including last winter, as well as multiple Big North Conference championships. Defense will certainly be emphasized this winter, as Carcich’s intense, upbeat style will require 32 minutes of commitment, in every game. The man will demand no less. Carcich coached at Passaic Valley for a dozen years, in which he led the Hornets to 11 straight winning seasons, a state sectional championship as well as three appearances in the sectional final. It’s hard to imagine that the Patriots won’t enjoy a good deal of success this winter, and beyond. After all, when he arrived at PV, in 2004, the Hornets were 6-63 in the previous three seasons. 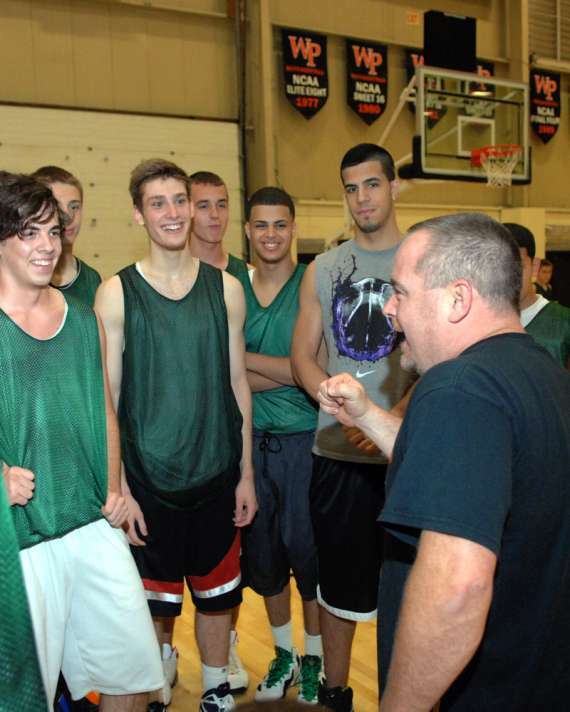 In his first season, Carcich led Passaic Valley to nine wins, and two years later, the team won a state championship. In 12 seasons, he won over 200 games at PV and averaged a 17-9 record, per season. Including his stops as a head coach at Palisades Park and Hasbrouck Heights, before coming to PV, Carcich is 107 games over .500 for his career. He’ll have an enthusiastic group of players when practice officially begins in a month. And those kids will learn the game the only way Carcich, himself a standout athlete at Hasbrouck Heights and later Pace University, knows how to administer. Having covered basketball for the better part of 43 years, I can safely say he’s the best coach I’ve ever been around. It should be an interesting season. All the best, Rob ! When it came to the Ramapo-Wayne Hills football rivalry, Lou Brandt was as staunch a Hills guy as there was. A 1991 graduate of Wayne Hills, Brandt hardly missed a game between the Patriots and Green Raiders, long after he played for Hills. But this year, he won’t be at the game. The 45-year-old Brandt is battling cancer, and in true Hills fashion, he’s fighting all the way. “We’re pulling for Lou, every day,” said Wayne Hills assistant coach Mike Kelly, one of Brandt’s closest friends. “Lou was a senior when I was in the sixth grade, but he’s the guy who made me a football player. I grew up playing soccer, but once I saw Lou and those guys playing at Hills, football was it for me. 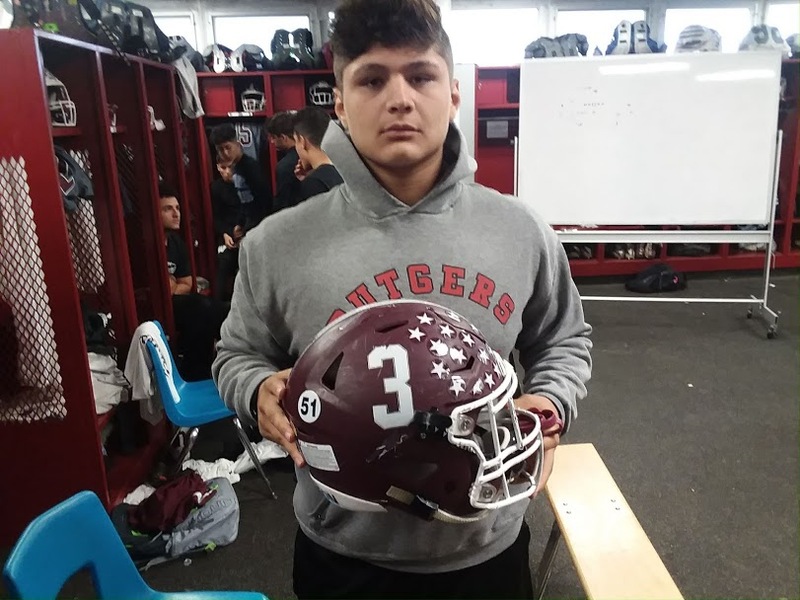 The Wayne Hills players donned Lou’s number 51 on the back of their helmets for the Oct. 12 home game, with Ramapo. Brandt was a standout offensive lineman for the Patriots and later played at the University of Massachusetts. Brandt would never miss the traditional Wayne Hills football beefsteak, which is held around the Thanksgiving holiday. He was at last year’s event, as vibrant as ever. However, a visit to the doctor this past spring revealed he was ill.